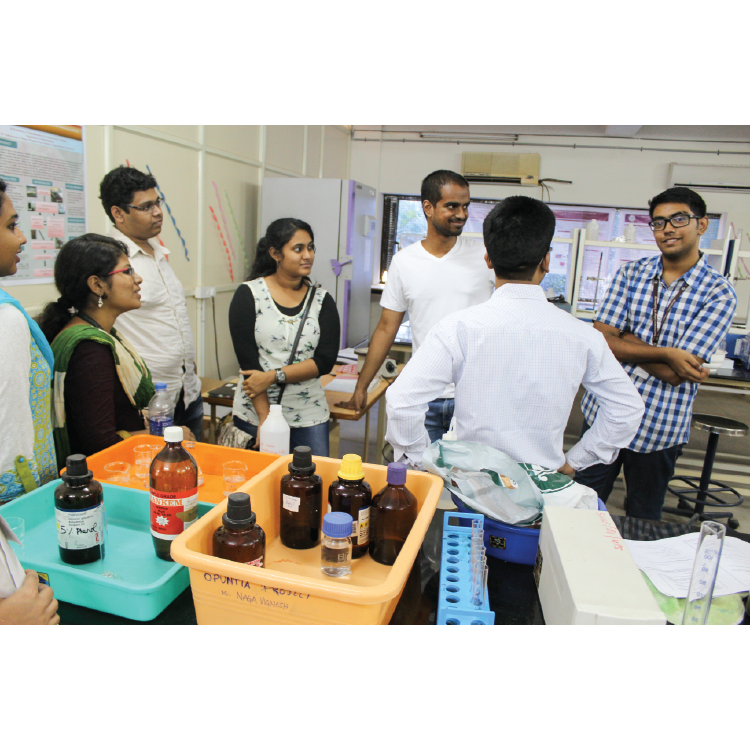 This year we hosted the INDIAN iGEM meet up in our campus. Presentations by the teams from IIT-Madras, IISc Bangalore and us to our professors which was followed by a questionnaire session. Possible avenues for collaborations was discussed, which turned out to be fruitful. Apart from this various fun events were organized that helped the teams bond together. We helped them debug their construct by suggesting possible promoters they can use, and answered their questions regarding T7 promoter. We also helped them with the CCMB method of competent cell preparation. We helped them characterize one of their composite parts, which is used to measure the strength of a promoter, transformed the plasmid containing their insert, and took fluorescence readings. In return they characterized one of our temperature sensitive parts..
Members of our team reached out to farmers in different districts in Tamil Nadu, to help team West minister understand the current scenario regarding biopesticides in India and the kind of impact their project would have. In return, they helped us with understanding the regulatory framework with regard to GMOs in the U.K. and circulated our urban survey. Along with IISC we visited two schools and conducted presentations on our respective projects, iGEM and synthetic biology. We also exchanged surveys with the following teams: Tec-Chihuahua, UPO Sevilla, Aachen University, Purdue, Virginia. Given the intricacies involved in troubleshooting wetlab protocols, we prepared a troubleshooting guide along with the help of Team Oxford, Team Edinburgh, Team Warwick, Team Kent and Team Technion which we think will be helpful for iGEM teams in the future. As an addendum this guide would also serve as a iGEM debut teams guide as we’ve explained how to go about human practices work, fundraising and other important aspects of participating in iGEM. To Download a PDF Version of the File, Click Here. AACHEN UNIVERSITY also cleared some doubts for us regarding the Wiki.